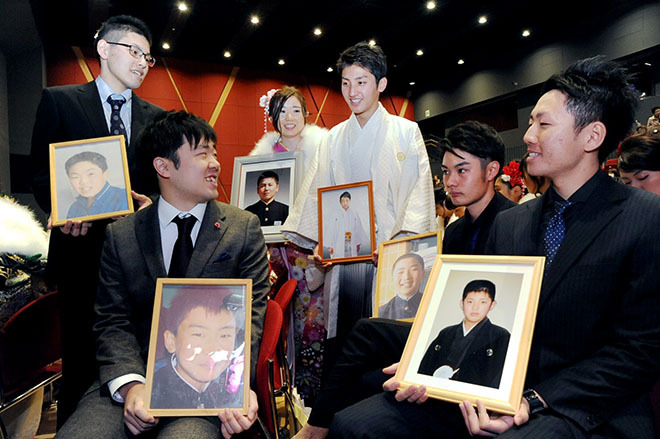 RIKUZENTAKATA, Iwate Prefecture--Five new adults held photographs during a Coming-of-Age Day ceremony here of six of their former classmates and fellow baseball team members who perished in the 2011 tsunami disaster. The five were first-year students at the city’s Otomo Junior High School when the Great East Japan Earthquake struck, triggering towering tsunami. Their classmates were among the 1,760 or so local residents who were killed or remain missing. “We will carry on lives on behalf of those six friends as well,” said Ayato Toba, 20, a second-year student at Iwate Medical University. The six who died were engulfed by the tsunami while shopping for commemorative gifts to present to older students who were graduating. From then on, their schoolmates placed their photos in the classroom and also took the portraits on school trips as a sign of their strong bonds toward the deceased. Every time the surviving team members return to Rikuzentakata they visit the homes of their deceased friends, whom they had known since they were very young, to pay their respects at home altars set up for the dead. The five survivors were among 202 new adults at the Jan. 7 ceremony.